1) The "SA Approach". Typical of Kühnen, he invents his own theorys and history and forms a new Ideology out of it. There never was a "SA-aproach" because at all times, the SA was subordinate of the Party and the Führer. He makes it sound like the SA was some sort of highschool of NS-Principles, which gave the entire Ideology its meaning and essence. With all respect to Dr. Brandt, I have just looked at Ernst Rohm's essay called 'Die nationalsozialistische Revolution und die S.A.' (the N-S Revolution and the S.A.) of 1934. Much of it is ironic in retrospect as he was to die not long after writing it; but the piece certainly gives the impression that from Rohm's perspective, the S.A. IS N-S! But most interesting of all is his notion that the N-S Revolution should be a CONSTANT Revolution, which must not stop until the complete 'nationalsocialistication' of ALL Germans. I will quote some extracts forthwith. Last edited by Moody; Friday, June 25th, 2004 at 05:25 PM. "The German revolution [i.e., that of 1933] is not about a change of power in the usual sense, (it is) rather the breakthrough of a new world-view [neuen Weltanschauung]". "The German folk unconditionally rejects the premises of democracy and of parliamentarianism, and affirms authoritarian leadership [autoritaren Fuhrertum]". These are replaced by the "idealism" of "the soul" and "the blood". "The SA is the combative bearer of the will and ideas of the German Revolution". "The Reich army [Reichsheer] is the instrument for national defence from the out-side". But the SA is such from the "INSIDE" [ib.,]. On this basis, Rohm says that "the SA represents the guarantor of peace in Central Europe". "It is amazing how mildly the N-S revolution in Germany has treated its enemies and haters". "Compared to the violent deeds and atrocities, compared to the sea of blood that other world-views have required in order to succeed, N-S has in the history of the revolutions of the world taken control of Germany with unprecedented greatness and discipline". Of course, this is due - Rohm would have us believe - to the SA, to the 'Brown-Shirts'. "With an incomprehensible mildness, the new regime in Germany since the rise to power has not ruthlessly cleared out the bearers and lackeys of the old and still older system. Only with the utmost caution do they go to work in their effort to turn back the wheel of revolution". Is there a hint here of a planned purge by the SA? Last edited by Moody; Friday, June 25th, 2004 at 07:15 PM. "The SA stands as an unshakable bulwark against reaction and materialism - for in it is embodied everything that constitutes the concept of the revolution". 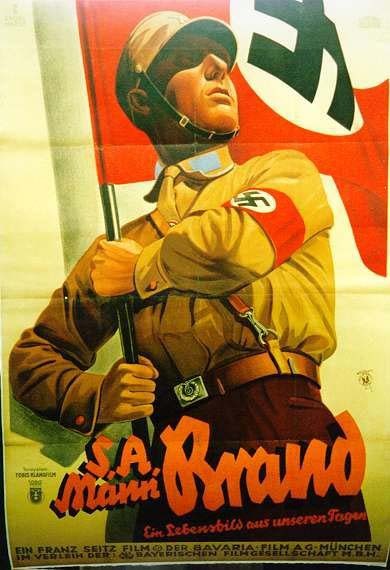 Not only does the SA embody N-S, but the SA ['brown soldiers'] have the central task for the future of N-S, for they are to be the "teachers, educators, and examlpes" not only for "National Socialism", but for "German thought and life" itself! "To form the German man into the 100% N-S in heart and in deed and thereby to enable him to be the living bearer of the genuine experienced and practical folk community - that is our final goal. Such a development is not completed in one day, rather it requires years and decades of endless educational work on the folk and on each individual". Given this, we may re-open the debate on whether Adolf Hitler was right to eliminate the SA in favour of the Reich army, or whether he should have gone with the SA and knocked back the Reich army and then took Germany on its never-ending 'brown' revolution! We could do that here or on a new thread in the future. Last edited by Moody; Friday, June 25th, 2004 at 07:14 PM. Although the SA-men felt let down and were upset about the situation in Germany after the NS-takeover, the final incidents wich led to the cleansing of SA leadership were staged by Himmler and Wagner who anonymously distributed handwritten notices among Munich SA men wich mentioned a coming coup. These notices were the justification for imprisonment of the SA leaders. While Röhm was executed for his aim of a SA-state, Himmler succeeded in building up a SS-state. After all, Hitler needed the Reichswehr more than the SA and so his decision to disempower the latter was justified. What about this Rohmish idea of turning every German into a National Socialist? A kind of 'denazification' in reverse. Not done through extermination of non-N-S, but via a long-term education programme? Who here would like to turn every member of their own nation [whatever it is] into a full-on 'white nationalist' (or whatever)? Does the Rohmish programme have a far-sightedness here lacking in the more compromised alternatives? That was after all also Hitler's idea, he spoke about it in the party rally of 1934: Hitler believed in the difference between the superficial "revolutionary" change of the outer conditions of power in a country, grasping absolute power, and the substancial "evolutionary" change: the mental transformation of the whole Volk into National-Socialists and the new shaping of society, which would take decades or even one or two generations. Hitler said somewhere that, if a former liberal or Social Democrat says: "You will never have me", he says: "We won't have you, but we will have your children". The same goes for the social-economic changes of society and the melting of the class society. Hitler simply knew that really substancial changes take here a longer time and must be done consequently, but carefully, and that one won't free the worker by wild raging around and destroying the whole society and economy. Also a sort of dawn of a pseudo-conservative-revolutionary state through an alliance Schleicher-Strasser with integration of right-wing SPD would have resulted in a rather frozen society of a national-authoritarian system than dynamicizing it like Hitlerian National Socialism. Hitlerism is truest and most consequent National Socialism. Hitler was in reality the greatest and most radical revolutionary, even if others may have showed on the surface more "revolutionary" impetus. Nothing is won if one makes a vulgo-Marxist "revolution" à la South America where the former lower classes just demolish everything, shoot the former surpressors and then replace them as new surpressors. One can be more demanding for a Nordic-Occidental type of revolution in a modern society. Wasn't the Rohmish conception more 'radical' in the usually accepted sense of the word 'radical'? It is said that his desire for a "Second Revolution" was similar to the Maoist idea of "Continuous Revolution" - surely a more radical conception of politics [TOO radical for Hitlerians]. Rohm in the work I have already quoted from talks of the need to turn all Germans into N-S; whereas Hermann Goering, in his 'Germany Reborn' [also 1934], talks of the need to make all Germans into GERMANS. In that subtle distinction we may see the difference. I didn't know Ernst Rohm could read let alone write. Let's face it, Germany wasn't big enough for both Hitler and Rohm. One had to go and after being, well shall we say, "exposed" on that island with the boys, Rohm's departure was all for the best.